The collaboration will investigate heart health outcomes and medication adherence among seniors, and is scheduled to begin in 2019. Earlier today, Johnson & Johnson announced plans for a multi-year research program it will be launching with Apple to explore the role Apple Watches could play in senior health monitoring. Set to kickoff later this year, the pragmatic randomized controlled trial study will be conducted in the US and enroll adults aged 65 years or older, according to a statement. Specifically, the primary goals of the research are to measure whether or not the smartwatch’s irregular rhythm notifications and a medication adherence app designed by J&J for the smartwatch might have an impact on the health outcomes of older adults. Apple CEO Tim Cook has been steadfast and vocal in his belief that Apple will soon be a major player within healthcare, and so far the company’s devices have already been featured in a handful of wellness programs from UnitedHealthcare, Vitality Group and others. Taken in hand with recent reports that the Cupertino has been speaking with private Medicare plans, an arrangement with another major industry player that’s focused on quantifying the device’s impact on the senior population is concrete evidence of Apple’s long-term plans to become a more prominent voice within consumer health technology. 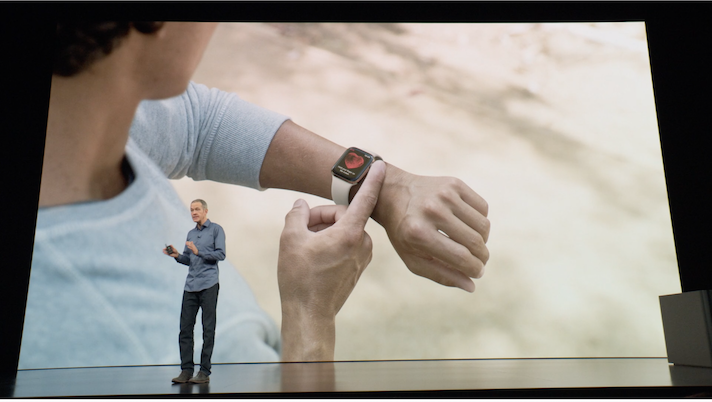 The past year has been quite a busy one for Apple between the announcements and launches of both the ECG-equipped Apple Watch 4 and the personal health record feature of iOS. The former has sparked excitement across the industry regarding whether an ECG reading might be too much information for the average consumer, as well as questions regarding the company’s silent and stealthy FDA clearance. Public consensus on the former is still panning out, with a growing number of hospitals and services announcing support for the platform. "We're excited about the potential of common, wearable technology to aid in the earlier detection and prevention of a frequent cause of stroke," Dr. Paul Stoffels, vice chair of the executive committee and chief scientific officer at J&J, said in a statement. "Too many people living with [atrial fibrillation] are unaware of their risk, and earlier detection, diagnosis and treatment of [atrial fibrillation] could significantly improve outcomes. Based on the insights generated through this research program, we may be able to develop new ways to detect other health conditions earlier in the future that also exhibit measurable physiological symptoms."